Chapter 1: Why is Mass Important? Mass is special! Mass is where we meet Christ! We get ready on the outside. When you are invited to a party or special event, how do you get ready? We get ready on the inside. 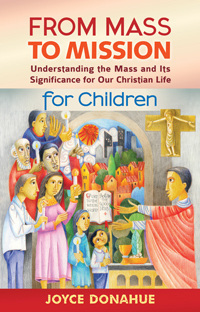 Read the readings for mass before you arrive. Think of someone or something that needs your prayer. God wants to talk to you. Though he may speak to you in prayer, he does this in a special way when you hear the words of the Bible at Mass. Do you have a favorite story from the Bible that we hear at Mass? Why do you like this story? Talk about this story with your parents. At the Last Supper, Jesus Christ turned bread and wine into his Body and Blood, sacrificed for us. He told us to do the same thing to remember him. We ask God to accept our lives, and money for the needs of the poor and the parish, as an offering along with the gifts of bread and wine, which we bring to the altar. Eucharist means "giving thanks." We give thanks to God in the Eucharistic Prayer. It has parts that are said by the priest and by the people, like a conversation. The priest asks the Holy Spirit to change the bread and wine into the Body and Blood of Christ. He also prays for the Holy Spirit to change us, so that we can serve Christ in the world. When we receive Christ in Holy Communion, we become more like him. Mass has ended. But this moment is also the beginning - of your mission to the world! "Go forth, the Mass is ended." We answer, "Thanks be to God." We are being sent to share his Good News and live what Jesus has taught us. We are happy to say "yes" to our mission. How is your family sent to serve? How can your family share the Good News of Christ with each other, friends, and other people?